Can anyone ever imagine the movement of a vehicle up a steep mountain, with its ignition off? Sounds quite unbelievable! Well, this magnet magic can be experienced while you are traveling to Leh-Ladakh. 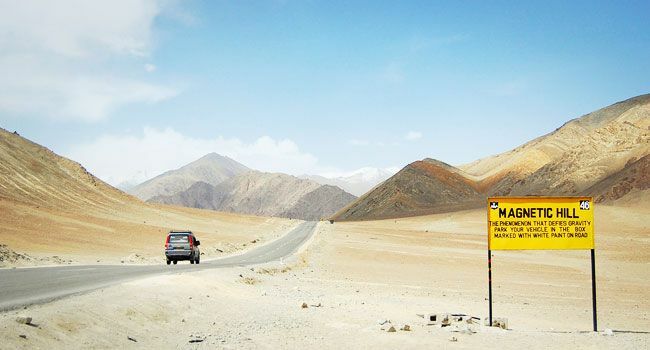 Located about 30 km from Leh, at a height of 11,000 feet above sea level, the hill supposedly has magnetic properties which attracts metallic objects, making vehicles move up at a speed of about 20 km/h with their engines off. Not only are the vehicles traveling on the road attracted by the magnetic powers of this hill, even the helicopters and aircraft feel the same magnetic impact. Locals and the Indo-Tibetan Border Police (ITBP) personnel claim that when the helicopters and aircrafts come with in the radius of this hill, they start to jerk. 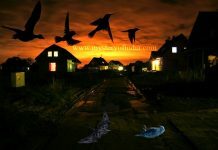 To avoid accidents, the fliers are advised to fly at specific speed and height. In fact, the Indian Air Force pilots always steer clear of the Magnetic Hill. The local administration has also put up a bill board to help tourists recognize the Magnetic Hill. The board clearly states the phenomenon leaving you to try this experience for yourself. What is the mystery of the Magnetic Hill in Ladakh? There are many explanations to it. Some claim that the vehicles move because of the magnetic properties present in the hill. 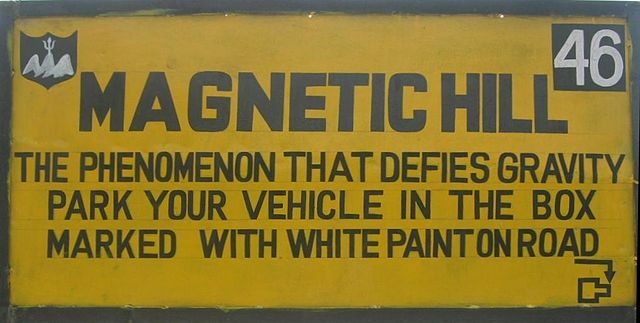 According to them, the magnetism here is so strong that it pulls the vehicles on its own. Others assign this spectacular phenomenon to supernatural powers. However, a third explanation that is much closer to the truth is optical illusion. It is believed that the surrounding land at Magnetic Hill produces an optical illusion, which makes a downward slope appear upward. Thus, a vehicle left out of gear will appear to be rolling uphill. Leh is one of the two districts that constitute Ladakh, the other being Kargil. 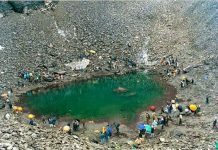 It is a part of the Indian state of Jammu & Kashmir. The magnet Hill is located on the Leh-Kargil-Srinagar national highway, about 30 km from Leh. On its south side flows the Sindhu river (Indus), which originates in Tibet and goes to Pakistan. A Sikh Gurudwara Pathar Sahib is located near the magnetic hill. The Gurdwara was built in 1517 to commemorate the visit to the Ladakh region of Guru Nanak Dev, the founder Guru of the Sikh faith. Due to both the Gurudwara and the gravity hill, the area has become a popular sightseeing destination. The magnetic hill has become a popular stop for domestic tourists on car journeys.